Cyclone Xynthia and other Tenerife storms call for action against global warming. The Cyclone Xynthia of 2010 at my home in Toscal by Puerto Cruz behaved differently compared to the Tenerife 2005 storm called Delta. A tiny bit of drizzle came with Xynthia. I know, because I was home at the time and observed the ferocious weather behavior from outside my corner veranda. From there, I can see the whole Orotava Valley which includes ocean and mountains. Hardly a better view is possible to study a cyclone at first hand. Indeed, the raging Tenerife winds which frightened the Puerto Cruz region in 2005 had looked much more dangerous. My neighbor's glass door wasn't cracked by the storm attack of 2010 called Xynthia, as happened by cyclone Delta in 2005. However, Xynthia blew a heavy wooden door onto his veranda, as shown below. So much to the power of Cyclone Xynthia. A very amazing fact as the door landed on a third floor which is more like a fourth one, as the high ceiling shop ground-floor isn't counted. I captured the photo above to show my family that the weather we had was indeed dangerous. Unless the heavy load had come from a nearby large roof top apartment where a family member of Restaurant La Finca lived. There the storm had left behind an utterly destroyed penthouse, as shown below. In fact, much gigantic debris was flying through the air in my neighborhood. The photo also shows a very big uprooted tree that lies in front of the Finca restaurant. Glass damage recorded to insurance companies for the region of Puerto de la Cruz was substantial. This was repeated by the Media at the time. Rain was not strong, though. A La Laguna resident called the cyclone Xynthia of February 27 to 28 a Deltita (small Delta) compared to the storm of 2005. I disagree, as we had little damage then. The comment about the Deltita was mentioned by the Spanish newspaper La Opinion on February 28, 2010 which reported on Cyclone Xynthia. Storm damage doesn't only depend on storm strength. It seems to make a difference, where exactly a storm hits, as in my neighbor's case. Mind that our verandas are only separated by about two meters. Yet, on my place, the windy elements felt more sever, as my roof top apartment is in a windy corner by the curb of the road. The end of February 2010 cyclone of Tenerife with its winds which felt like 30 degrees celsius reached 160km/hour by Mount Teide. There, warm storm air mixed with cold clouds above Spain's highest snow capped peak. Such storm strength did not help hundreds of pines in the Teide national park which were cut by it. Mind that many of them may have also been vulnerable due to soil erosion. This could not always be prevented after the Tenerife bush fires. Vilaflor, the highest located Tenerife town, lived through similar strong Xynthia turbulences. Guia de Isora above Los Gigantes reported agricultural damage to its tomato and other farming. Also, banana plantations in various Tenerife locations suffered great financial loss by cyclone Xynthia. A couple of cranes tipped over and billboards were sent flying by the hot whirling gales but, no Tenerife human life was lost. Tenerife electric power was shut down by the strong, circulating winds, as happened before during the rainy 2010 February storms. Outside communication appliances were not spared by storm Delta nor by cyclone Xynthia. My friend Petra in Romántica II could not call me on her mobile phone. 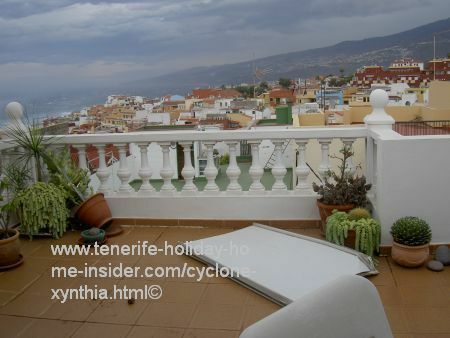 Cyclone Xynthia Tenerife storm strength. By the way, average storm strength by Xynthia Tenerife at the end of February was only 75km/hour, which didn't make it a real cyclone everywhere. Winds on my site felt indeed like 120km/hour with red alert. Therefor, I slept badly on that night, fearing worse, as no rain soothed the gales. Later in the early morning hours, the cyclone in Toscal Longuera seemed to have accelerated. But no obvious danger lurked besides the prevailing power cut. My electricity was off for about 10 hours, by the way. Fortunately, the most popular and biggest Longuera Cafeteria, called Bar Paraiso supplied food and drink. They use gas besides electricity for some cooking. Cooking gas in Tenerife is often favored together with electric power, as the latter is not reliable. 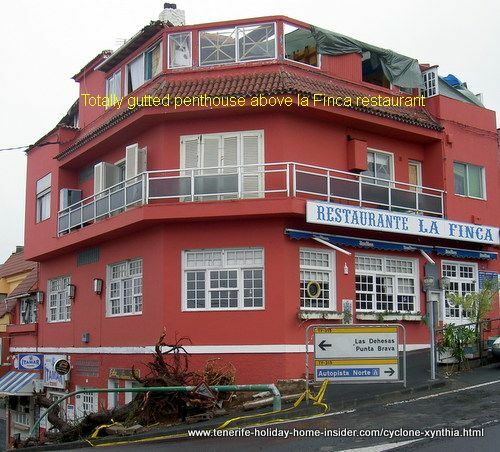 My friend Petra Molkenbuhr was staying in a holiday home in Tenerife in lower La Romántica II during cyclone Xynthia's attack. A friend was visiting her, when its scary winds started. They told me about flying huge plant boxes and heavy tools, which landed on their small veranda. Also the holiday home's doors didn't seem to be secured well. They were very heavily shaking. The Xyntia storms originated from the Atlantic Coast of West Africa near the equator, where tropical land climate prevails. Then, Xynthia made its way northwesterly towards the Canary Islands. It brought sand loaded Kalima from the Sahara with it at some stage which made everybody in my neighborhood cough. The cyclone was felt on the islands Gran Canaria and hit Tenerife and La Palma most. It continued past La Madeira with relentless speed, brushed past parts of Portugal and mainland Spain. It caused 53 or more deaths in Western France mainly by flooding. It was even felt in Switzerland and Germany. The menacing weather front even proceeded towards the UK in Europe's north. This was discussed and illustrated in the Spanish forum of meteorologia foro.meterored.com in Spanish. A friend of my family called Eugen Bercks of Hillcrest Durban South Africa, who was the most famous bird catcher for zoos in Africa, pointed out an environmental warning to us in the early Nineties. He told us after a visit to Senegal West Africa that many hardwood trees were cut in Central and West Africa for exports to Asia. Its forests were shrinking and no new trees were planted, he said. He added that this would speed up global warming. The Canary islands with Tenerife are only about 100 - 200 km from West Africa which is a short distance in meteorological terms. Deforestation prevents rain and moisture to settle in trees and soil. Then, all African heat is free to rise. When hot air meets cold air, such as near the west coast of Saharan Africa, storms form. Cyclone Xynthia may very well have been such a result. From Cyclone Xynthia back to climate in Tenerife with tips how to prevent cyclone damage to property. Care for the environment by eco art Tenerife Spain at Punta Brava which is mentioned for environmental problems with its ancient fishermen dwellings on the rocks. It remains to wonder if those houses are as much endangered as some in France were by the end of the winter cyclone of 2010. Cyclone Xynthia drowned too many sleeping inhabitants in their flooded houses in the French Charente Maritime regions. However, their modern town and coastal planning may have been to blame for it. Petra Molkenbuhr said that she would have felt much safer and happier in our Tenerife studio, where she stayed before and could also use a regular phone in the entrance. But that studio had been rented out from Ocober 2009 until end of March 2010 as a 2nd residence. It was too late, when she contacted me, while planning her Tenerife holidays. She enjoyed them very much, except for her stormy Romántica apartment with cyclone Xynthia.